Saturday May 11th 1895 I was busy all forenoon with the baking and dinner. Will went to town in the afternoon. I churned and then went down to the garden to do a little work. It was fairly cold today. I read in the evening. Sunday May 12th 1895 We went to church this morning and over home to dinner. They had a turkey roasted. It was nine years today since Will and I were married. We come home in time to look after the evening work. It is very cold. Monday May 13th 1895 I churned this monring and did the other work. In the afternoon made a couple of bonnets. Will is planting corn on the Hanks land. Miss Linder came back tonight. I have more chickens hatching. weather still very cold. Tuesday May 14th 1895 It was some pleasant today. I worked out in the yard all the time I could get from the housework. I fixed cans to set out my tomato plants. I was very tired tonight. Wednesday May 15th 1895 Weather cooler again. I was busy all forenoon with baking and Will churned for me. I sewed a little in the afternoon and was looking after some chickens I have hatching. I read in the evening. Will was in town. 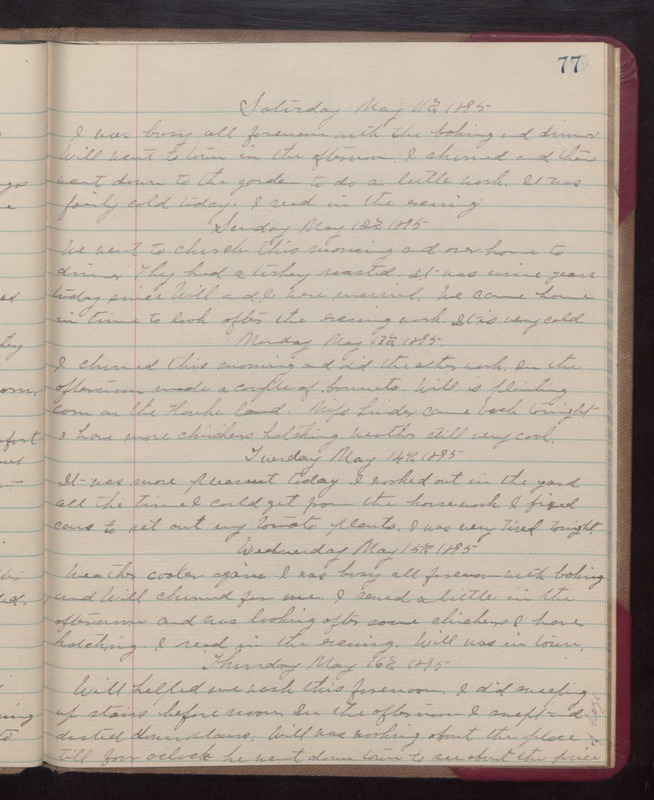 Thursday May 16th 1895 Will helped me wash this forenoon. I did sweeping up stairs before noon. In the afternoon I swept and dusted down stairs. Will was working about the place. till four oclock. He went down town to see about the price of hogs.